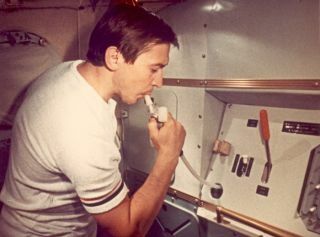 A Soviet test engineer drinks from a water dispenser in the Soyuz spacecraft mock-up in 1975. In this historical photo from the U.S. space agency, an interior view of the orbital module of a Soviet Soyuz spacecraft mock-up, located at the Cosmonaut Training Center (Star City) near Moscow. This view shows a Soviet test engineer drinking from a water dispenser. The orbital module is one of three major components of the Soyuz spacecraft. The other two components are the descent vehicle and the instrument assembly module. This photograph was made from a frame of the 35mm motion picture film entitled "Checkout of the Compatibility of Equipment in the Soyuz Spacecraft Mock-up."